A yacht where our guests are treated like true VIP's. 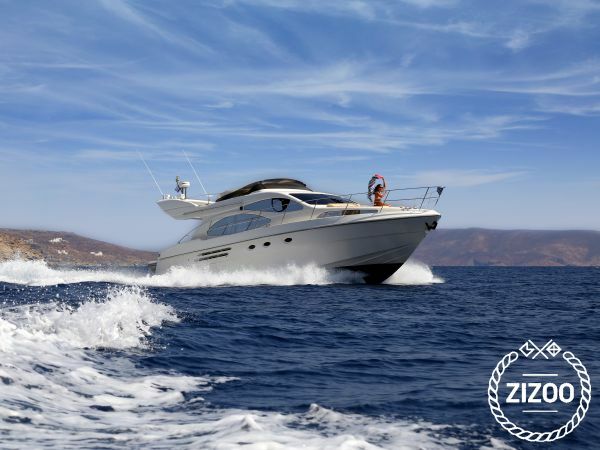 Convivial and designed for entertaining, this wonderful motor cruiser is designed for elegant living and it is bound to impress anyone who comes aboard. The salon is an ultra-stylish entertaining area surrounded by vast amounts of window space and beautiful high-gloss cherry woodwork. Typical of European yachts, the galley is set below the salon level where it’s hidden from view. The VIP guest cabin offers a glorious queen size bed and all the cabins have an ensuite shower for complete privacy. This yacht has a total length of 49 ft. and it has fully stocked bar and kitchen. What makes her unique is the large and comfortable Flybridge, where you can either lie down on the spacious sun beds and feel the sun or sit on one of its spacious seats and enjoy the beautiful view. The yacht is renowned for the comfort it provides, not only on the main deck but also in the salon which ensures the ease and comfort of the guests.